I’ve been training calisthenics since the back end of 2011, in that time I have gained a lot of strength. I can perform one arm chin-ups, human flags, muscle-ups, front and back levers and many more. However, though I did gain quite a bit of muscle in the first couple of years, my body has been relatively unchanged, with only minor muscle gains since then. This has been because I have devoted my time to getting the most strength I can out of my workouts, whilst only eating enough to maintain my weight. 2017 is the year of growth, I’ve decided it’s time to pack on some more muscle, using mostly calisthenics (plus a bit of dead-lifting). The before picture here was taken about 9 months before I started my training. I was travelling at the time and not really eating very well. I weighed under 60kg. The after picture was taken around 2 years into my training. I had followed a strict plan of Convict Conditioning for the first year. The second year I had moved onto my own training, focusing more on strength over hypertrophy. I should also hold my hand up and say that second picture was done after a tough workout, so I had a bit of a “pump” going on, which made me look a little bigger than I was. I probably weighed around 65kg at the time. Overall I’m pretty happy with where my upper body is at. In particular, my lats have grown a lot from years of one arm pull-up training. 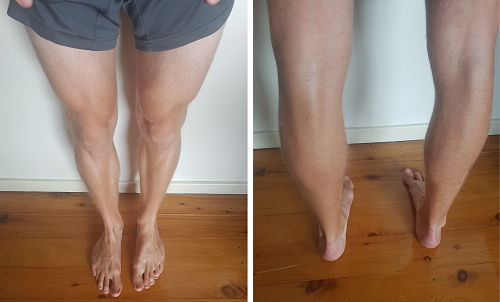 My legs need some work, so I will be pushing my leg sessions hard. The above pictures were taken first thing in the morning, I’ve not had anything to eat yet or done any workout. This will be standard I will stick to as I take my progression photos. I currently weigh about 67kg first thing in the morning. My bodyfat is around 12%. My target for 2017 is to increase my weight up to 75kg, whilst also dropping my bodyfat down to 10%. I’m a classic hard gainer (ectomorph body type), so this isn’t going to be easy. On top of this I have also given myself some strength goals this year, so I still want to improve my (relative) strength. I am going to revamp my training and eat a lot more food, whilst cleaning it up a little further. My training for the last 3 years has mostly consisted of low reps, concentrating on maximising my workout for strength. To gain more muscle, I’m going to have change that. To maximise muscle growth you have to go a little higher on the reps (generally accepted as 8-12). However, I still want to be able to improve my strength, so I must do this in a way that caters for this. To do this I’m going to combine both a strength and hypertrophy session into one. When doing the strength sets, it’s really important that I stick to strict form. Otherwise I’ll teach my nervous system to do the movement incorrectly. For the hypertrophy sets, it will help get more reps out by safely compromising the movement. For example, with pull-ups, you can compromise the movement by giving a bit of a kick if you’re struggling. This isn’t going to give you an injury but it does make it a little easier. However, we want to do as many strict as we can, so I will only kick towards the end of the set. For strength sets, you need at least 2 minutes rest for your ATP-PC to recover. However, for hypertrophy you don’t want your ATP-PC to recover. After 12 reps your muscles will be burning from a build-up of Hydrogen Ions in the muscle. We want to start our next set before this has fully recovered. Therefore, I’m going to give myself just one minutes rest between hypertrophy sets. This session will focus the hypertrophy on pulling movements. There are 2 major pulling movement patterns, vertical and horizontal pulling. Therefore my hypertrophy will have one of these each. The strength will focus on my main long term goals at the moment, which are one arm pull-up/chin-up, human flag and slow muscle-up. Strength sets – 5 sets each, done as a circuit with 2 minutes at the end of every set. Hypertrophy sets – 3 sets of each exercise before moving onto the next. Take a minutes rest between each set. This session will focus the hypertrophy on pushing movements. There are 2 major pushing movement patterns, vertical and horizontal pushing (dips are generally classed as horizontal pushing). In this session the strength will concentrate more on deadlifting. The reason I have started deadlifting is very simple, I’ve found I really enjoy it. If you’re not into weights, then single leg step downs combined with bridging or back levers will cover the muscles the deadlift uses. For the hypertrophy, we generally want to cover a quad dominant exercise and a glute dominant exercise. This is a session I do with my students, therefore I can include some partner based exercises. In this session the strength sets will include some hip adductor work, as this is a particular weak area of mine. Whilst HIIT sessions are all the rage these days for burning fat, I shall be running twice a week instead. If you train at high intensity you will burn more calories, but we know that my goal is to consume more calories than I burn. High intensity work also tends to burn more glucose than body fat. This can be beneficial as if your glucose stores are low then you tend to burn more fat with your day to day activities. However, if your glucose stores are low and you train at high intensities, your body will tend to favour burning muscle over fat. The exact opposite of what I’m trying to achieve. Therefore I’ll save my glucose for my hypertrophy sessions and use slow recovery runs to burn a little extra fat. This will involve running with my HR at or below 146 (180 – my age). As the weeks progress, I will find that my speed at this HR increases. This type of training is referred to as base training and is very common in the off season for professional athletes. Base training for a few months will also have the added benefit of setting me up nicely for Tough Mudder in October. In order to gain weight up to 75kg, I need to eat at a calorie surplus. I use My Fitness Pal to track my calories as well as set my targets. Setting my current weight, goals and current level of exercise has given me a target of 3000 calories a day. Now I’ll be honest, I know that tracking my calories every single day for the next year is not going to be maintainable. Therefore, I’ll do it for a week to give me an idea of how much food that is, then use this to ensure I eat enough going forward. With regular weigh-ins I will know if I need to eat more. To get my fat down to 10% I shall have to eat strict, however my first goal is simply to gain the weight at not too fast a rate. This should ensure that I’m not gaining too much fat. Once I’m closing on 75kg, I shall have a DEXA scan to see what my bodyfat is and adjust my diet accordingly. In the past I have been very firm on avoiding supplements. However, I have realised that this was my ego driving this, as I wanted to be able to say I can get strong without supplementing. In the last year I have opened my mind to scientifically backed supplements. Examine.com is probably the best site on the web to determine if a supplement is worth taking or whether it’s marketing BS. Using this, I have determined that Creatine is something that I should take, as it has many strength and hypertrophy benefits with no side affects. Despite the marketing, the timing of protein is not very important, as long as I eat enough throughout the day. On top of this, having a goal of 3000 calories is quite difficult without taking extra calories. Therefore, I am using Optimum Nutrition Pro Gainer, which has a combined calorie intake of 642 calories per serve. I chose this one as it only has 6g of sugar, which is less than I’d have were I to drink a glass of milk. I chose the double chocolate and it tastes pretty good. If you are interested in following my progress, you can see my pics on Instagram and I’ll be writing follow-up posts every few months. I was wondering how you are doing with your Growing Muscle Through Calisthenics program? Do you have any progress pictures? I am female, 46years old, a classic hard gainer/ectomorph and have never taken any supplements. 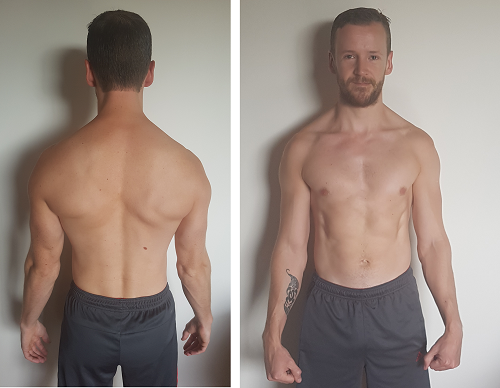 I have done mostly body building in the past but I’m interested in trying your program as some of my goals include one arm push ups/pull ups, hand stand push ups and the human flag…and hypertrophy. It’s gone very well thanks Nicola, I now weigh in at 70kg, having gained 5kg and still looking pretty lean. I’ve put the bulk on hold for now as it is harder to gain or even maintain strength, so concentrating on this now and maintaining my weight. Maybe I’ll come back to it next year depending on my goals.